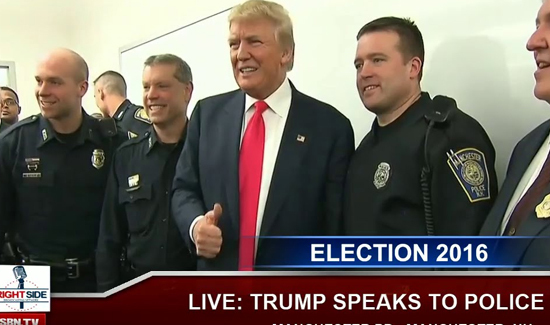 A national police organization’s endorsement of Donald Trump has exposed a divide within the ranks of law enforcement: Can they support someone who calls himself the law-and-order candidate but was caught on tape bragging about sexually predatory behavior toward women? And what about Trump antagonizing the very minority communities that police agencies need to win over amid turmoil over police shootings of unarmed black men? Last month, the national Fraternal Order of Police endorsed the New York businessman, saying he’s the candidate who takes time to understand the issues facing law enforcement. Now, some officers — particularly African-Americans — are questioning whether Trump is worthy of the endorsement. The FOP and Trump were to have appeared at a rally last Monday in Philadelphia, weeks after the endorsement was made. But the event was abruptly canceled after the release of a video from 2005 in which Trump can be heard making a series of vulgar and sexually aggressive remarks about women.